Laird has introduced a new Sterling 60 series of Wi-Fi and Bluetooth modules that provide unmatched connectivity, and improves network efficiency and spectrum use. The new modules also enable optimal mobile device performance in the most challenging wireless environments. 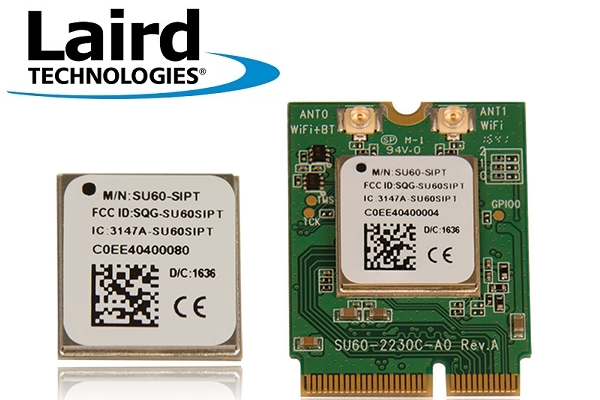 Laird’s new Sterling 60 family of certified 802.11ac 2x2 MU-MIMO Wi-Fi + Bluetooth v4.2 modules (Bluetooth 5 SIG certified Q4 modules) are the first of two classes of modules that give developers a lot of flexibility in wireless design, especially for mission critical connectivity requirements in industrial, medical, and enterprise applications. Enabling MU-MIMO in these areas means that APs (Access Points) can send data to multiple devices simultaneously. Instead of sharing bandwidth, devices can have their own data stream, which dramatically improves network efficiency and spectrum usage and enhances the performance for all devices on the network. The Sterling 60 series builds on the security and robustness inherited from Laird’s expertise in its 40, 45, and 50 Series modules, meaning ultra-high data rates, improved performance, and the most reliable wireless in crucial applications such as medical and industrial. This is the first series of modules from Laird to feature dual-band 802.11ac Wave 2 Wi-Fi with 2x2 MU-MIMO and Bluetooth 5 capabilities. Furthermore, Marvell’s cutting-edge silicon process technology will allow the 60 Series to offer leading-edge performance while also providing significantly improved power efficiency. The modules are available in a SiP and M.2 packages and are compatible with the FlexPIFA and mFlexPIFA antennas from Laird. Modules and development kits are now available. For more information about Laird’s Sterling 60 module, click here.